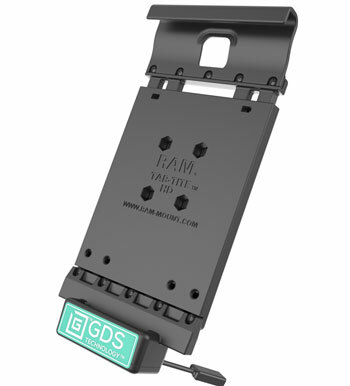 The RAM vehicle dock with GDS™ Technology is a spring loaded, quick release cradle that offers a secure fit with easy access to the mounted tablet. This docking station is compatible with the Samsung Galaxy Tab A 8.0 with IntelliSkin™. See Technical Tab below for Instructions and Specifications. GDS™ Technology offers a universal charging platform for any device wrapped in IntelliSkin™. Connect to High Definition Video through a Slimport, MHL, or device specific HD video adapter.